Remember that variables can be used to represent integer values such as 3 or 5, but integer variables cannot be used to store “floating point” values such as 4.5 or 1.27. For floating point variables, you would use the variable type “real”. 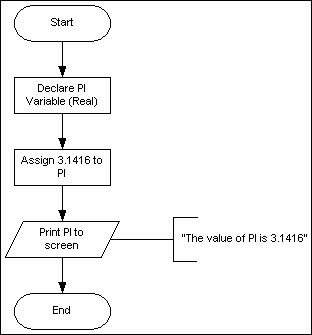 Create a program that assigns the value 3.1416 to a variable named "pi", then prints "The value of pi is <value of pi>".